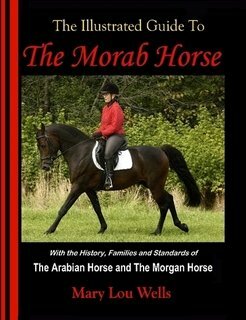 The Morab horse is now regarded as a breed in its own right. 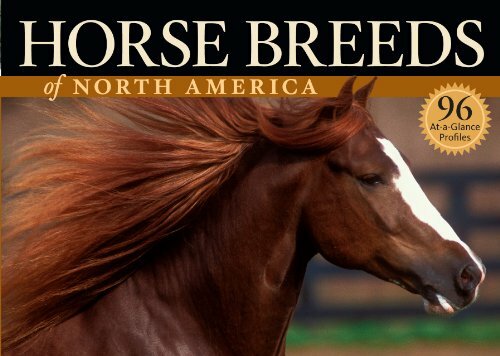 It is one of America's very own breeds, created by crossing Arabians and Morgans. Both these breeds have many desirable traits. However exceptional the breeds, cross-breeding does not always result in an animal with the best characteristics of each parent. There is often no consistency of type even between siblings. But in the case of the Arabian and the Morgan, the distinctive, positive attributes of both breeds are transmitted uniformly from generation to generation. The breed is highly prepotent, passing on the refined beauty, symmetry and sensitivity of the Arab coupled with the strength and depth of the Morgan. A stallion, Golddust, is believed to be the first recorded Morab. He was bred by Andrew Hoke in 1855 from a Vermont Morgan out of a mare believed to be by Zilcaadi, an imported Arabian. At nearly 16hh, Golddust was the fastest horse in Kentucky at the time. There is little documentation of Morabs until 1920 when William Randolph Hearst bred a number of Morabs for working cattle on his ranch, much of which was quite mountainous. Hearst is credited with coining the word 'Morab'. The Morab soon became renowned as a cutting horse possessing great endurance combined with an equable temperament. know about this truly American breed. The Morab ranges from 14.1hh to 15.2hh. It is compact and well-muscled but always shows refinement, especially in the head. The back is short with well-sprung ribs but deep through the girth. Like the Arab, the Morab has one less vertebrae in the spine than other breeds. It has inherited the longer croup of the Morgan and these characteristics give the Morab strength and a smooth gait. The chest is broad and deep giving plenty of heart and lung room which accounts for the Morab's stamina and speed. There is very little slope to the croup, another point of difference with other breeds. The neck has good length with an attractive natural arch but free of coarseness. It should blend smoothly into a sloping shoulder. The coat is fine and silky with the mane and forelock full and again silky. It has inherited dense bone and a medium-length pastern from its Morgan forebears and a broad hard hoof from the Arabian. These attributes, coupled with well-developed, flat joints and short cannon bones results in a very low incidence of foot and leg problems. The horse should stand squarely with 'a leg at each corner' as the saying goes. There should be no suggestion of 'cow hocks'. Depending on the breeding, the action may be somewhat elevated or lower but always free moving with good impulsion coming from the muscled hindquarters. The Morab is intelligent and dependable. It has a friendly, calm but willing disposition. a description, history, uses and origins. Because of its trainability and kindness, the Morab is suited to most equestrian pursuits. It excels in competitive fields such as endurance, cutting, dressage, jumping and harness but also makes a wonderful working or trail horse. Its equable, people-loving nature makes it adaptable to all riders and the pleasure of riding a Morab is not confined to the experienced or the professional. Seniors, amateurs and children can all enjoy the charms of the Morab. The International Morab Breeders’ Association (IMBA) is devoted to the promotion and enjoyment of Morab horses. The Association was formed in 1986 and incorporated in 1987.